IPBlackList is a tool for checking if an IP address is listed in various black lists, such as SPAM databases, banned IP addresses, open proxies or mail relays, etc. This tool is instrumental in figuring out why a given IP address is rejected by some network resources, such as mail servers. IPBlackList checks the entered IP address against the databases maintained by numerous DNSBL servers (click here for more information on this technology). In brief, this tool works as follows: For instance, you want to check if 1.2.3.4 is on the black list maintained by the antispam.somedomain.com server. IPBlackList sends a DNS query that looks like 4.3.2.1.antispam.somedomain.com to the default DNS server. If such a DNS record exists, i.e. the specified host address is resolvable to an IP address (according to the DNSBL specifications, such IP address must belong to the range of local IP addresses, i.e. 127.x.x.x. ), then the IP address we're checking, 1.2.3.4, is blacklisted. Please note that we do not maintain any of these lists, and therefore we cannot remove you from any of them. IPBlackList allows you to check an IP address against multiple DNSBL servers simultaneously. 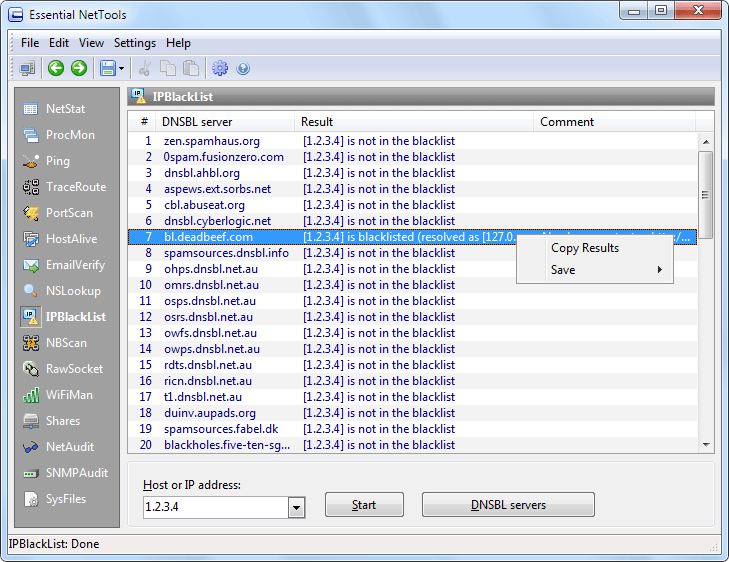 Essential NetTools includes a list of popular DNSBL servers, but you can use your own list by clicking on the DNSBL servers button. An up-to-date list of functioning DNSBL servers is available at http://www.declude.com/Articles.asp?ID=97 . · Copy Results – copies the IPBlackList table to the clipboard. · Save – saves the IPBlackList table to a file.